Our baby is about to transition to her crib, and does a lot of position shifting. She maneuvers to where her feet stick through the slats. Is there a danger here? If so, any suggestions? 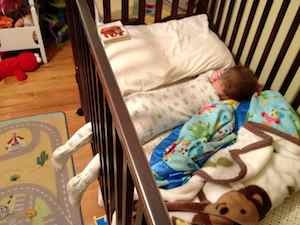 I have never seen or heard of any problems related to children getting arms or legs stuck in the crib slats. This issue is one largely created after the AAP recommended the removal of crib bumpers to reduce the risk of SIDS. Typically, my children would cry out in the night until we released the trapped body part. One of my younger boys seemed to prefer having a leg stuck through the bars. He never seemed uncomfortable and therefore we just left his leg hanging out. As a parent, you should make you can hear your child if they cry out and make sure the crib is safe. The crib bars need to be stable, smooth and no more than 2 3/8 inches apart.